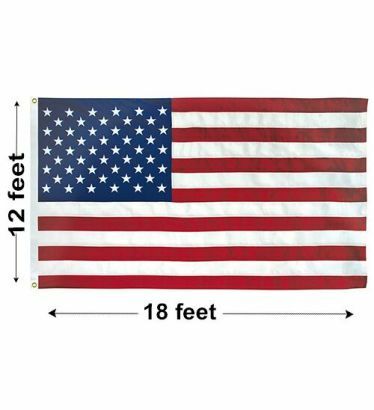 12'x18' U.S. Polyester Outdoor Flags are typically used for inground flagpoles from 60' to 70'. These 100% Made in the USA commercial grade flags are generally used in commercial and governmental settings. The large embroidered stars and the sewn stripes provide its exceptional beauty. The use of the CHEF sewing method and all of the reinforcements provide for its exceptional life. 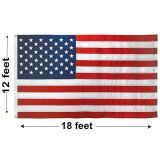 This 12'x18' U.S. Polyester Flag was developed with the expectation that it would be flown continuouly day and night in higher wind areas. If you need assistance choosing between materials, please allow us to advise you. Frequently buyers are "oversold" on polyester. The idea is to balance the flag's flyability with its longevity. Generally you will save money and be happier with your purchase. Your flag will be a source of pride to everyone who sees it, so try to choose one that will fly and not tatter quickly. We're happy to help. Constructed for heavy commercial use. 24-7 Use in Medium and High Winds. In Medium to High Wind areas, Polyester is the best option. The heavier material slows the fly-end velocity allowing a longer life. Best in areas with ocassional high winds to keep flag dry from moisture that causes mildew rot. Premium craftsmanship, right down to the fine embroidery makes these American flags a treasure to cherish. Sewn using our advanced CHEF sewing method with many added reinforcement features. Stripes seams are sewn with same sewing method used on the inseams of LEE and Levi Jeans. Stars embroidered with a full white embroidery technique with no gaps. Fly-hems are finished with 6 vertical rows of lock-stitching and back tacked. Finished with a heavy-duty, 9 oz. "Super-White", no-shrink, hoist-heading. Made of 9 oz Poly Sateen which is thicker and a brighter white than the 7 oz duck heading used by most in the market. It is 100% Made in America by Americans. A letter of origin is available upon request.